November 14th is Take the Lead Day. Get discounts on Lyft rides on November 14 with the codes on this coupon. In case you haven’t noticed, nowadays people get around by Ubering or Lyfting instead of taking a cab or taxi. 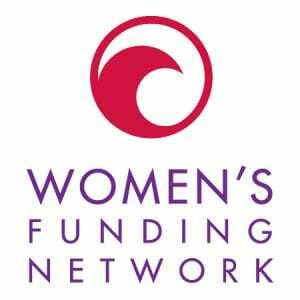 As these web-based transportation services grow, an exciting collaborations appears to be growing as well, specifically between Take the Lead, the women’s leadership organization steered by longtime feminist leader Gloria Feldt, and the company Lyft. 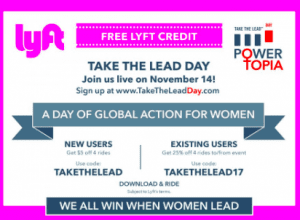 To demonstrate its support of Take the Lead, the growing multi-billion dollar rideshare business is offering discounts on rides in honor of Take the Lead Day on November 14th. While Uber and Lyft are reportedly in stiff competition for riders, some reviews of the two services reveal that Lyft is known for being a friendlier and more customer-service-oriented ride. Another big factor that may give Lyft and long-term edge: according to a detailed review on Ridester, Lyft reportedly does not jack the rates up 7 to 8 times the normal rate during high volume travel times. While Lyft does increase rates during high volume travel times, the increases are reportedly closer to 1 or 2 times the price. “I’m especially delighted to welcome Lyft as a sponsor of Take The Lead Day because they truly do care about ‘lifting women to parity,’” said Gloria Feldt, president and co-founder of Take The Lead, in a recent announcement about the sponsorship. During Domestic Violence Awareness month in October, Lyft offered free rides to survivors of domestic violence in Arizona — a great way for the company to be community-oriented in its services. Lyft partnered with the Arizona Coalition to End Sexual and Domestic Violence and Maricopa County Centralized Screening 24/7 hotline to provide the free services to domestic violence survivors. “Lyft has always been at the forefront of advancing women and fighting for gender equality in the workplace,” said Drena Kusari, Lyft General Manager, Southwest Region. On Take the Lead Day, the organization is holding a half-day seminar in New York City, as well as co-occurring events in Arizona, New York, and Massachusetts, to name just a few of the locations across the country. The event in New York is called Powertopia, and features a wide array of speakers and networking activities.